Imagine if Apple only updated the iPhone every 16 years? How much better would it have to be than the previous model to justify the hoo-haa? Honda is about to launch its fifth generation Gold Wing, sixteen years since the last update, when it grew to 1800cc, lost a bit of weight and gained a chassis that handled like a 21st century grand tourer should. That’s a long time for any product to remain unchanged so before any one comes out with the usual clichés, pause for a moment to consider just how good that bike must be. In Gold Wing history though, it was the third generation that really made the legend. In 1988, when the rest of biking was only just getting used to water-cooling and fairings, Honda’s six-cylinder GL1500 was simply stunning. Peak power was 100bhp – a number that was still respectable for a sports bike back then, but it arrived at half the rpm of a GSX-R and it was the torque figure of 110lb-ft that was really important. As engines go it wasn’t exactly memorable to use, but it did a great job of getting an awful lot of mass around an awful lot of miles with a lack of fuss and reliability to die for. Not a bike built for speed – flat out is around 100mph - the GL1500 was huge and heavy (368kg) and came at a time when Honda was at its most confident, building bikes to last forever in a way that no one has really matched since. Being a Wing, it needed a killer gadget to set tongues wagging. Suzuki had already done the electric screen trick on their GSX1100F late in 1987, so Honda trumped everyone by fitting the new Wing with a reverse ‘gear’. It wasn’t actually part of the main transmission, but instead was linked to the starter motor. Pull the special lever, press the starter and the bike went backwards at a gentle pace – perfect for pulling out of sloping parking spaces. Shame they didn’t do the screen electric too though – it’s the one big flaw on this very big bike. In many other ways it was evolution of the now-established Gold Wing thinking. A low seat, easy power, predictable handling and stable on the brakes. Surprisingly easy to ride at low-medium speeds and when the high speed weave appeared above 90mph, it did so steadily and progressively, giving the rider plenty of warning and time to back off. The air suspension was adjustable using a built-in compressor and running the correct settings (along with the right tyre pressures made the high speed handling more stable. As a nation obsessed with sports bikes it was easy for us nippers to poke fun at the GL1500, especially watching Mr and Mrs Microphone trying to turn one round in the road. But while we were roundabout surfing on Sunday afternoons waiting for the works GP contract, they were pioneers of the adventure bike movement; going further than riders before them and sowing the seeds for our current fascination with travel and touring. Every time I ride a MKIII Wing it makes me smile. By modern standards the handling is too soft, tyres not supportive enough and cassette players and FM radios are quirky, but useless. The best thing in 2017 is that a well-chosen late model GL1500 is a great way to get into Mr and Mrs touring. Relatively cheap to buy, most are well looked after and resale values are rock solid, so you can run one for a summer, see if you like it and, if not, sell it on with zero depreciation. Common problems include rust around the swing-arm area, rusted exhaust collector boxes and worn brake discs (because, hidden behind the shrouds, not everyone checks pads as often as they should). Expect to pay around £4000 for a tidy example with less than 80,000 miles. 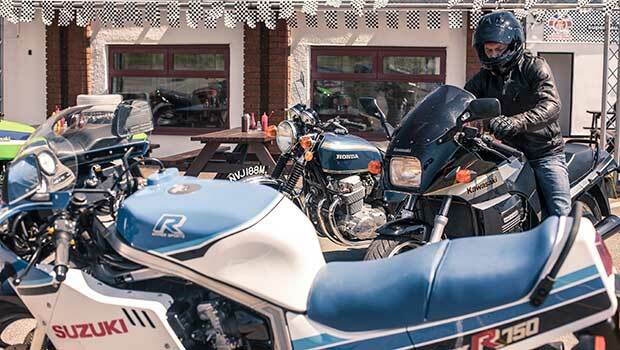 Expect also a bike that cruises smoothly at legal speeds, handles and brakes better than most ten year-old Harleys and opens up a world of new mates and good times with the very active owners club.